The YWCA is an International membership based movement. It enrolls members and maintains a record of all members- Electoral, Associate and Junior; therefore, the membership department is the heart of the Organization. The emphasis has been on developing a responsive and qualitative membership. This year a new category of membership called Project Membership has been introduced to include women of the outreach projects to gain a better insight into their needs. The details are being worked out. A translation of the membership form in Hindi has been prepared to facilitate members who need it. A Database on membership is maintained and updated by the Membership department regularly. Orientation: An orientation for the Members on Saturday 16 February. Thirty one members were present. Dr. Shakuntala David began the session with the session on Vision and Mission of the YWCA of Delhi. Ms Blessina Kumar advised the members on good governance and best practices. While Ms Rekha Kapila gave inputs on the on the constitution as well as the roles and responsibilities of chairpersons and committee members. Family Get together: A Family Get Together was Organized at the request of the Nominations Committee who wanted an opportunity to meet members in a casual atmosphere. It was an evening of fun and excitement the members registered and participated in various games. 21st Annual Inter School Debate for the YWCA Rolling Trophy was held on Tuesday 16 July 2013. The topic of the debate was “Social Media Brings About Positive Change”. There has been an unprecedented increase in the number of schools participating in this event for the last two years. 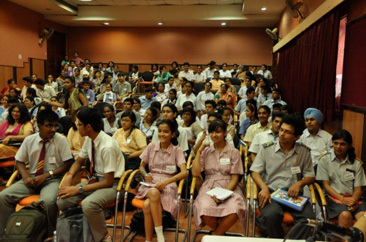 19 leading schools of Delhi took part. Two speakers per school were allowed for the motion and against the motion; two interjectors and five students for cheering. Membership Renewal: Enrolment and renewal of membership starts on 1st April each year and closes on 30th June which was a Sunday this year so the office was kept open on 29 June though it was a non-working Saturday to enable last minute renewals and for handing over membership records to the Nominations Committee. The Chairperson and co chairperson of the Nominating committee took over the forms, registers and receipt books on 29 June at 5 p.m.
Members’ Summer Get together: was celebrated on Saturday 18 May 2013 from 12 noon onwards with the theme “Beat the heat with cool summer salads.” Members brought cool and refreshing salads and shared grandmother’s tips on traditional foods and beverages that beat the summer heat. A prayerful beginning with scripture reading, a prayer set the ball rolling. The HOD gave an introduction on salads in general and the Co-chairperson Ms Joshua co-ordinated the event, Discussions carried on regarding grandmothers’ traditional recipe and various tips using different foods were discussed. Personnel Committee members joined the group at lunchtime. Every Year the Christmas Celebration for YWCA of Delhi is Organized by the Membership Department. Last year, being the Centenary year, the Membership Department jointly with the Centenary Committee Organized a splendid show for the Grand Finale of the Centenary Celebrations of the YWCA of Delhi. ‘Illuminating Lives’ was the theme of the Centenary year. The event took place on 15 December 2012 evening. The programme began on a religious note as members of Religious Education Committee and the staff sang carols while guests came pouring in. Santa Claus had a list of hundred children coming for the celebration in the festive shamiana and he distributed gifts to them as he stood next to the glittering Christmas tree. Dr. Jasveer Rana from the ‘Capital City Minstrels’ had volunteered for this role. The programme began on a religious note with scripture reading from Isaiah chapter 9:1-7 read by Ms Sylvia Lal followed by intercessory prayers by Ms Mary Hope. The Chairperson Ms Aruna Jacob and Ms Sylvia Lal sang a duet. Many carols were sung to get into the Christmas mood. The Vice President, Ms Hazel Siromoni gave the welcome address. The film on YWCA’s hundred years of existence was shown giving the message of Service with Love. The audience was moved as they recollected many nostalgic moments. The Chief Guest, Ms Rema Daniel, President of the National YWCA gave a message on the loyalty and hard work of the long serving staff and appreciated the contributions made by the dedicated members, who worked for the uplift of women and the community. Twenty one staff who had served the YWCA of Delhi for more than twenty five years were felicitated and received a cash token of Rs 5000/- and a beautiful memento. It was a joyous moment for the staff to receive it in the Centenary Year. A power-point presentation showed the details of the employees as each was called up on stage by the General Secretary. A Bharat Natyam recital choreographed by Ms Sumathi Morgan, a YWCA member added splendour to the beautiful programme. The theme of the dance was Illuminating Lives and the song “Athi Pitha Kumaran” was of praise to the Holy Trinity and Jesus Christ as light of the world. The enthralling bands “L for Vendetta” and “Cobbled Street” performed as the audience put on their dancing shoes and rejoiced together. Then came a serene and peaceful moment with lights switched off, as the band sang “Silent Night” and the audience held hundreds of candles with their flames flickering in the dark. The Religious Education Committee released a prayer booklet containing prayers for different occasions. The program ended with prayers being recited. This was followed by the vote of thanks by the Vice President, Ms. Reena Bhatti. A sumptuous delicious dinner served around a bonfire followed and brought the jubilations to a joyous end.